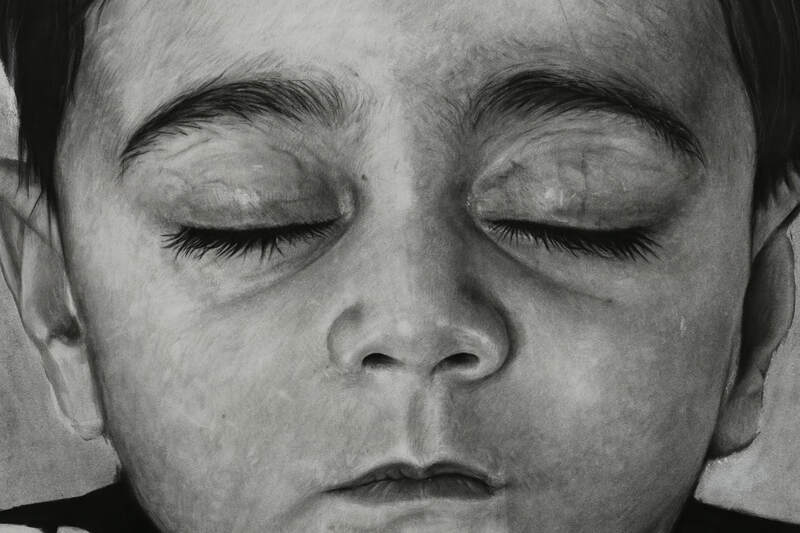 Detail shot of drawing Head of Child I (From a Distance) 2016, graphite powder and pencil on paper, 150 x 150 cm. Under the fear of war, as thousands of families fled ­their homelands, a mother of twin infants started her journey to seek a safer place. During the journey, a tragedy occurred. Due to the geographical location, the mother was most likely coming from the Middle East or Asia, crossing the deadliest route to Europe over the Mediterranean Sea by boat. During the harsh physical struggle of the journey, the mother lost one of her twin infants. Despite the loss, she kept the dead child with her for days on the boat. As tensions rose, the smugglers tried to force the mother to throw the body of her child into the sea. She refused and kept the body with her. One night, while the mother was sleeping, the smugglers took action. The mother woke to realize that her living child was missing and that she had been left with the dead child. The smugglers had mistakenly thrown the sleeping twin into the sea. I heard this account while it was being retold around Swedish refugee camps, and I began to see it as a kind of myth. I have explored this story through making a series of drawings in order to cope, understand, expose and transmit the potential of this story to further audiences. What happened on the boat that night is one string in a collection of narratives, which also encapsulate what I myself experienced as a refugee fifteen years ago.